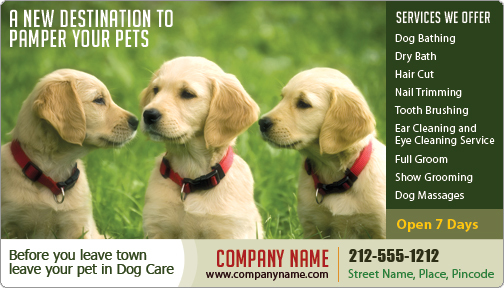 Ever thought of the benefits of using Dog Care Magnets Round Corner for your business promotion? 3×4 Dog Care Magnets Round Corner is well sought to promote vet clinics, pet care centers, pet food shops and many more. The generous imprint area will put your logo and business message in limelight easily. The ridiculously low price tag of these custom magnets makes it a good option for budget promotions. Animal Clinic Magnets are hugely popular promotional giveaways for tradeshows, conventions, store openings and much more. This magnet looks perfect over the refrigerator door or other metal surface due to its rounded corners. Most advertisers agree that the bulk of their sales come from the relationships they maintain with their past business acquaintances and clients. Custom animal clinic magnets that are retained for long will keep your business information fresh in their minds for long. It is a good option to attract new clients as well. Every time a pet owner is looking for a pet health clinic, these custom magnets will ensure that your information will be right at the tips of their fingers. Referrals: Customers who get promotional gifts are 14% more likely to refer that business to their friends and well wishers. Long lasting and cute giveaways like pet clinic magnets that are retained by clients for a long time can trigger a viral promotional effect because people will recall your brand name much more easier than when you never had any promotional gifts. Flexibility: Promotional magnets are available in a range of shapes from mild to wild and downright whimsical to grab instant attention of the clients. These custom magnets that are made of high quality magnetic material will keep your logo well stuck on to their refrigerator doors, filing cabinets or infact any magnetic surface to make your logo highly familiar. Pets make integral parts of most homes and to find the pet care clinic details right in front of their eyes will be so comforting for the anxious pet owners on any day. Every time they need your services, they will surely recollect your name. Marketing Plan: A magnet is always stuck safely instead of a conventional business card that people often throw away or misplace never to be found when they need it the most. Magnets are low in cost yet high in impact as these impressions have a long lasting impact than most promotional products. Express your thanks: Custom magnets are not just your business cards but also double up as thoughtful gifts that most people treasure. A Survey Inc. study found that people who received promotional gifts are likely to have a more positive attitude towards that company. Custommagnetsdirect offers a wide range of personalized magnetic giveaways for all of your marketing needs. Made from premium quality material that will last long, these magnets retain their ability to stick on to metal for a long time. Put in your logo and business message on the wide imprint area and let your brand make a statement!